Robert Hall wants a keyboard shortcut for maximizing a window. There's no way to do this with one keystroke. But you can do it with two. If you want to maximize an application window, press ALT-SPACE. (In other words, hold down the Alt key while you press the space bar.) This will pop up the current application's System menu--the same one you get if you click the little icon in the window's top-left corner. Once the menu is up, pressing x will maximize the window. 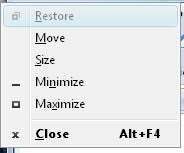 You can also press n to minimize it or, if it's already maximized, r to restore it to its pre-maximized state. What about a document window within an application? Assuming the application supports the Multiple Document Interface (MDI), press ALT-HYPHEN (in other words, hold down the Alt key while you press the hyphen or - key) for the menu. Then follow the same instructions as above.